Earlier this year, State & Local Policy Manager Ken McLeod went to Davis, California, a Platinum Bicycle Friendly Community that also is the home of the University of California, Davis, which has earned Platinum status as a Bicycle Friendly University and a Bicycle Friendly Business. While there, he worked with sponsor Ground Control Systems to make a video (viewable at the bottom of this article). When I was offered the chance to go to Davis, I jumped at it. Since coming to work at the League in 2012 I had learned about Davis — the city with the highest rates of bike use in the United States; Davis — the city that began experimenting with protected bike lanes in the 1970s; Davis – the university that is closed to most car traffic; Davis — the community where a Bicycle Hall of Fame anchors a town square. How could I not take the opportunity to check it out? What I found was a great place to bike, made possible by a commitment from the University of California, Davis, the City of Davis and many people within both institutions to making bicycling a safe and easy choice. On my first ride, as I rode in an exceptionally wide bicycle lane while sipping iced coffee before entering one of many bicycle roundabouts on the UC Davis campus, it was immediately apparent why close to 25% of people in Davis choose to commute by bike and close to 50% of students choose to arrive at campus by bike: it’s safe, it’s easy and there’s no reason not to. What struck me most as I rode the laid back bicycle that had been loaned to me by UC Davis staff around the University and the City was that the pervasiveness of bicycle infrastructure was much more striking than its design. Several times while navigating the Davis bike loop, a 12-mile loop through the City and University that utilizes trails, neighborhood streets, and campus boulevards, I found myself lost. I wasn’t lost in the sense that a bicyclist can be lost in many American cities, where a trail or bike lane unceremoniously ends and it is not clear where to go to reconnect to a bike route, but lost because I had followed the nicest looking bike infrastructure and that happened to not be the City’s signature loop. There were so many trails, signalized bicycle crossings, bike lanes, bollard-protected intersections and lanes that it was sometimes difficult to know where the community was channeling me to go — because it wasn’t channeling me, it was allowing me to bike wherever I wanted. Davis is not a perfect community for bicycling; you can still find yourself on a 4- or 5-lane road that would not look out of place in any American city. However, you can feel the efforts that the city and the university have made and the years of experimentation and success that they have had creating safe and comfortable places to bike. 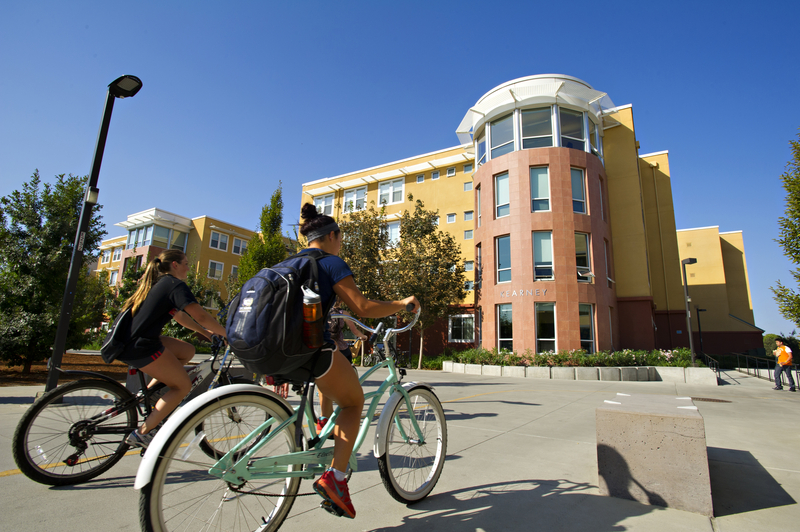 Davis is not Amsterdam, it didn’t spring up around canals, cobblestones, and cycletracks; it is a college town with about 65,000 residents that has consciously worked to make sure that biking is an option for its residents and students. Some of the choices that the community and university have made are atypical — like closing most of the university campus to motor vehicles in 1961 — but there is nothing unique about them that prevents another community or university from following in their footsteps. I hope that this video spurs communities and universities to think about the efforts that have been made in Davis and see the manifest success of those efforts as inspiration for their own efforts, both bold and boring, to improve conditions for bicyclists. I want to thank Ground Control Systems for embracing the Bicycle Friendly America program and sponsoring this video, the UC Davis staff – particularly recently retired bicycle program manager David Takemoto-Weerts, and the City of Davis for being great hosts and great examples for the rest of the United States when it comes to creating safe and comfortable places to bike. Ken McLeod is State & Local Policy Manager for the League of American Bicylists.